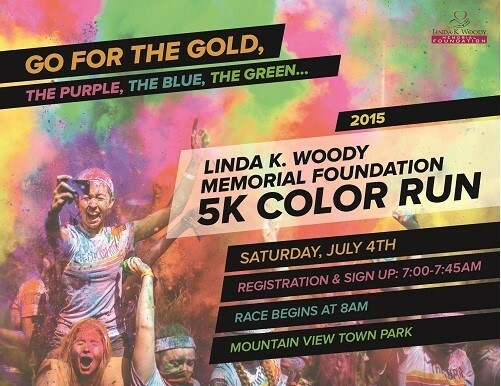 May 26, 2015 - The 14th Annual Linda K. Woody Memorial Foundation 5K Fun Run/Walk will take place on Saturday, July 4th, 2015 in Mountain View, WY. This year’s race is a color run, wherein runners will run through clouds of color at every 1-kilometer mark. Runners can wear white at the starting line and finish covered in a multitude of colors. The race begins at 8:00 am at the Mountain View Town Park and attracts both advanced competitors as well as individuals who want to support the foundation. Since the race is being held on the 4th of July, there will be several family activities that can be enjoyed after the event including a parade, BBQ, games, music, and fireworks. Participants may register in advance online at www.UnionWireless.com by following the “Linda K. Woody 5K Color Run” link or by visiting www.LKWMF.org. They may also visit facebook.com/LKWMemorialFoundation. Registration will be from 7:00 am to 7:45 am at the Mountain View Town Park on the day of the event. The tax-deductible registration fee is $15.00 in advance or $20.00 the day of the race, both of which include a t-shirt, or $10.00 with no t-shirt. Prizes will be awarded to the race winners in specific age and gender categories. Registrants will also receive other items donated by event sponsors. For more information on the race, including how to volunteer or provide prizes, call (307) 782-6131. The Linda K. Woody Foundation is a 501 (c) (3) non-profit organization, established in 1999 with the primary focus of improving the quality of life in the Bridger Valley area. Proceeds from the 5K Color Run will go to both the Children’s Learning Foundation and for a counseling endeavor geared toward children at risk. “We want to further focus on the needs of young teens and make substance abuse counseling, after school programs, and other support available for the community,” said Stacey Aughe, Board Member of the Linda K. Woody Foundation.